Your brewery list for Bacon Fest, take three. And my thumb. The Southwest Bacon Fest is back Saturday at Balloon Fiesta Park for a third edition. The event runs from 10 a.m. to 5 p.m. and will feature a slew of eateries and food trucks providing bacon-centric dishes, plus of course there will be beer. 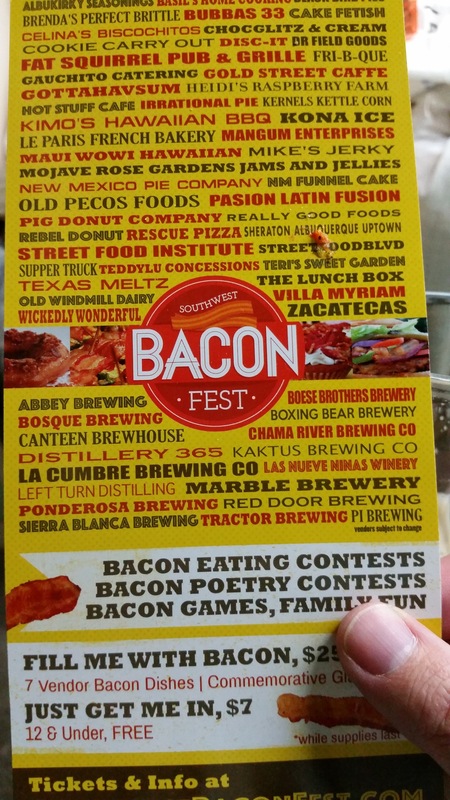 You can buy a ticket for as little as $7, or buy a $25 ticket and get seven tokens to exchange for special bacon bites and bacon beers. The Crew will let others handle the “what bacon dishes are there” aspect of this. As per usual with any festival, our mission is to get you the beer lists for the 15 participating breweries. Well, perhaps due to festival fatigue, or just my own lack of free time in which to persistently nag them (blame the start of the high school state tournament season, which will occupy undue amounts of my time in the next few weeks, but it’s all for beer money, so it’s worth it), we did not get all of them (yet). I will endeavor to update this list as many times as needed before the gates swing open. Here is what we have to date. If I were going, and it seems unlikely I will make it due to the aforementioned state soccer tournament and a public memorial for my Isotopes/Lobos colleague Stu Walker (who died unexpectedly on Monday), my picks for the beers you have to try, brewery by brewery, would be Patriot Porter at Boese Brothers, Chocolate Milk Stout at Boxing Bear, old favorite Dark & Lusty at Canteen, Smoke Em Out at Chama (Zach went over the top with this one, for those who love smoked beers), Faulty Barrel-Aged Ale at Distillery 365, that ferocious-looking Cherrywood Smoked Chipotle Porter at Kaktus, Jubilee at Ponderosa, Anniversary Double Red at Red Door, and the mysterious Breakfast Beer at Tractor. Again, as other breweries send over their lists, I will keep updating this. Have fun out there! Remember your sunscreen, drink plenty of water, and stay safe. Pi brewery will be serving our west coast red, IPA, pre prohibition Pilsner and porter.